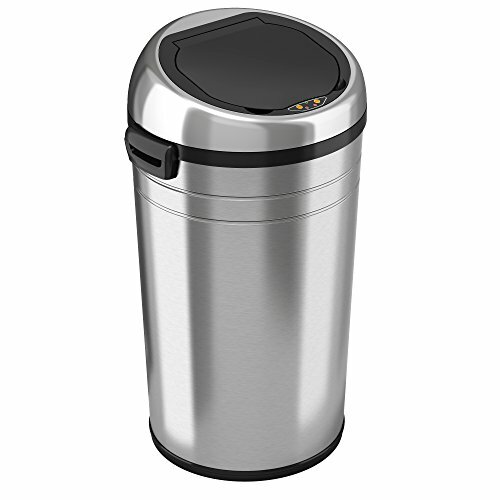 What to Look for When Buying Dog Proof Trash Cans? Why Use a Dog Proof Trash Can? How to Keep Your Dog Out of the Trash Can? This has got to be one of the best inventions ever! It’s actually a very necessary invention if you ask me. There are actually reasons as to why our pups love to go through our household trash cans. No, it’s not just to make a mess that you, unfortunately, have to clean up. Although it can be frustrating and maybe even cute at times, dumpster diving for our pet pooches can actually pose some health risks. So, why do they love to go through our trash? Well, some researchers think that wolves first had socializing contact with humans by going through our trash eons ago. And that behavior can be seen in a lot of our pups today. If coming home to garbage strewn about the house is commonplace for you, then think about investing in a dog proof trash can. The trash we generate nowadays contains much more toxic materials than our ancestors before us. Snacking out of the trash could be a health hazard for our beloved canines. Let’s look at some trash cans that can save us the trouble of cleaning up, and worrying about our pets’ health. What a sleek model this is that comes in 5 colors and 2 styles! 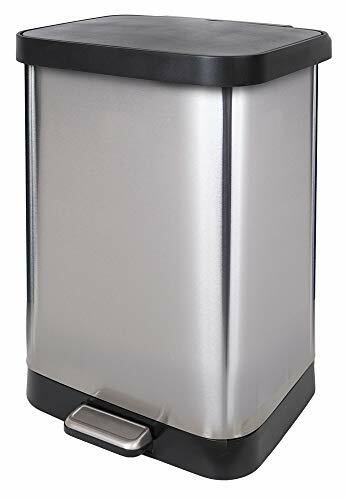 This isn’t just a normal step trash can, there is a secure side lock to ensure nothing tumbles out even if it does get knocked over by your pooch. 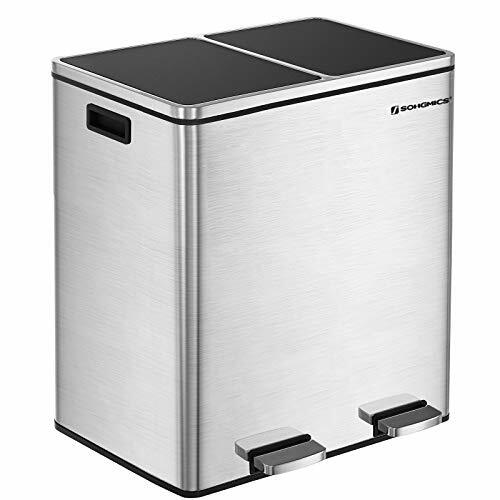 The design is ergonomic and allows this trash can to fit easily into small spaces in your kitchen. The strong pedal steps guarantees to last for at least 150,000 steps. The specially designed dampeners provide resistance for the lid as it closes, so as to not alert your dog of new additions to the garbage he can rummage through. Why We Like It – The custom fit garbage liners stay neatly hidden. This doesn’t give your pooch the chance to pull at a corner, topple the garbage can over if you forget to lock it and go treasure hunting in the trash. I am loving all these sleek designs! They can match up with any sort of décor and make your kitchen look chic! 100% satisfaction guaranteed, this completely touchless option has an unconditional warranty, which includes parts and dedicated customer support! The perk of this model is odor control. As we know, our dogs have an impeccable sense of smell. Dissuade them from going digging through the trash with the natural carbon filter to absorb and neutralize odors. If your dog does decide to go head to head with this contraption to get to what’s inside, the stainless steel will be able to withstand your dog’s wrath. Why We Like It – The extra long life battery only withdraws power as needed. The touchless option allows you to open the lid without soiling your hand. 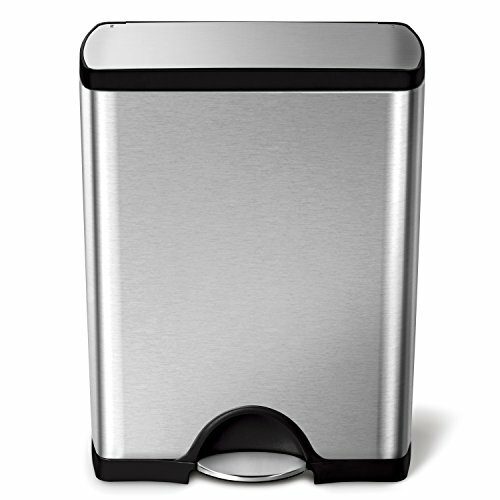 Another design from simplehuman, this trash can has a lid that splits down and opens from the middle. The purpose for this is to clear low countertops and to fit into a counter cabinet without the lid hitting the top. This gives you the option to hide this treasure chest of leftovers from your pup. Another slim and space-efficient design, the custom fit liners that keep your dog from getting to the trash and are strong enough and resistant to tears and leaks in the garbage. We all know that a tear or a leak is what can really attract your dog to your garbage can. Why We Like It – The slim shape and thoughtful center opening butterfly lid design makes it even easier for you to keep this device hidden from your pet. No more surprise clean-ups when you get home! This design might not seem very dog proof, but it’s sturdy enough for commercial use, and it’s not easy to drag, topple or push around by your dog. The easy swing lid design keeps garbage out of sight with a secure bag ring that also hides the trash bag, so your dog won’t be able to pull and tear at it. If you’re still afraid your dog can somehow get through the swing hole and pull out the trash, simply use a drawstring trash bag, and voila, problem solved! 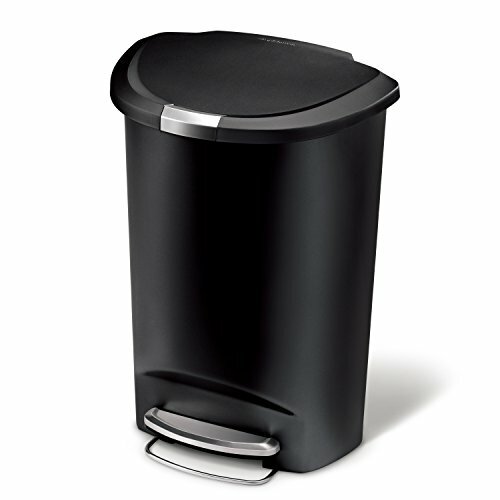 Place this trash can in your kitchen, anywhere else in your house or even outside! It works anywhere away from your dog and is easy to maintain. Simply wipe the surface and rid the trash can of any garbage residue with a damp cloth. Why We Liked It – It can sometimes be a hassle to step open a lid or even wave your hand in front of a sensor if the sensor is weak. Easily throw your trash away with this swing lid design that is still safe against your pup. If you liked the fingerprint-proof coating of the other simplehuman design but you didn’t like the butterfly lid, here is another option for you. For those of us that produce more trash, the stay-open lid allows you to keep it open for as long as you want and has liner locking, which is also resistant to your dog if he decides to try and tear the bag away. The removable inner bucket catches any messy drips and keeps the mess inside, so your dog won’t be tempted by the juices of leftover food or containers. Simply lift the bucket out, rinse and clean. Complete with a 10-year warranty, this is another product of solid engineering designed to last for years. Why We Like It – Simplehuman prides themselves in making sturdy and ergonomic designs that can go in any household and can last for years. Backed by their warranty, investing in these durable products is a good move for us with pets that love to roughhouse. This is a great option. The lids fit snugly into the rim, so it’s virtually impossible for your pet to get their noses under it, flip it open, and eventually tumble headfirst into the trash. The 2 separate trash compartments are also extremely useful to help you sort your trash. Who says a garbage can can’t be dog proof and convenient to use at the same time? The two-foot pedal option is also very appealing. You do not have to open both sides at the same time, and the rectangular shape fits closely against the wall, and out of your way. Hopefully, it fits in your kitchen so well that your dog won’t even notice it! Simplehuman is really knocking the competition out of the park by securing more than 3 spaces on our top 10 list! We’ve given a lot of kitchen trash can designs, and now we present you with a bathroom one. Dogs also take it upon themselves to go through bathroom trash cans much to our dismay. This design also has custom fit liners that are perfectly concealed within the can. The compact design is perfect for small spaces and inconspicuous enough not to attract your dog’s attention. This model also comes with a removable inner bucket that keeps the mess inside the can. Why We Like It – This is a smaller option that is ideal for those whose dogs like to go through any trash can, not only ones in the kitchen. 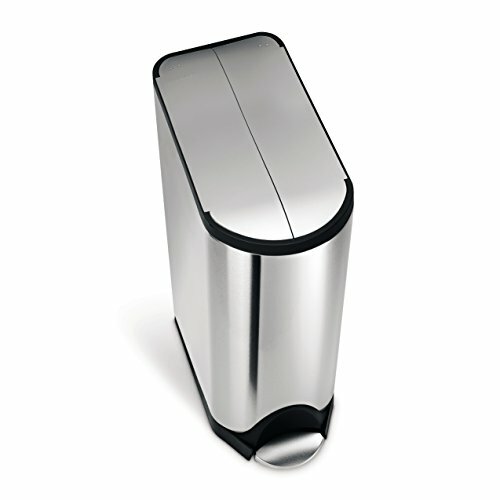 The small size makes it easy to put this cute trash can in your office, room or bathroom. iTouchless is a close follower to the simplehuman designs. They also take up a lot of spaces on our list. As you can probably tell from their name, iTouchless specializes in touch-free designs. 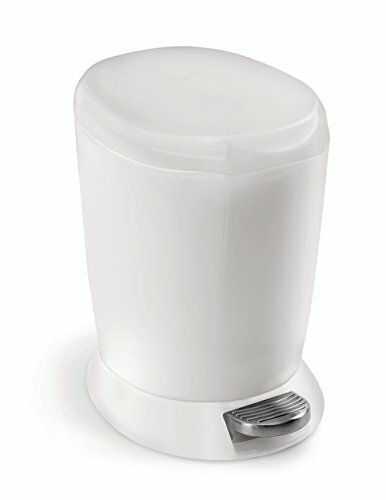 This is an extra large option with the same infrared sensor to help keep your hands clean. There are four caster-wheels installed in the bottom that makes it easily portable, to move around if your dog goes looking for it. Very easy to clean and smudge and fingerprint resistant, this futuristic design fits easily into your home. The touch-free design requires four D batteries, which are not included, or an optional AC adapter which is sold separately. Why We Like It – Don’t worry about snagging your hand on the closing lid as it has a built-in status alert. Solid green means the lid is in stay open mode, ad blinking red means it’s about to close. Odor protection is important even if you don’t own a pet. No one likes to smell the unpleasant stench of garbage. This Clorox odor protection has antimicrobial protection of the lid and lid frame by inhibiting bacteria from growing. This is a sanitary option for both you and your pooch. 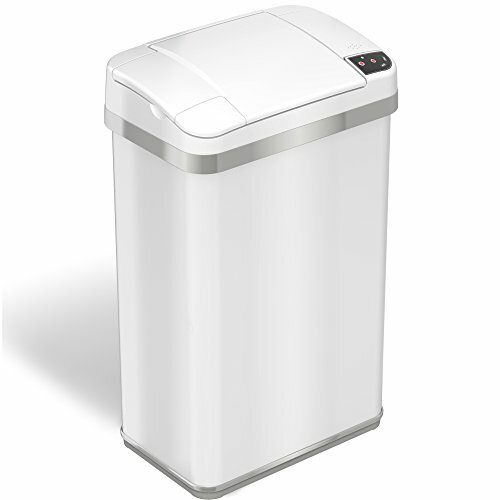 This model conveniently stores trash bags behind the trash can in a built-in compartment. 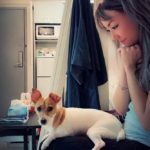 They dispense easily from the side and facilitates the process of taking out the garbage, and minimizing the time for your pooch to figure out what you’re doing, and take the opportunity to rummage through your garbage. Why We Like It – The bag rings in the can support your bag and keeps the sides hidden from the outside for aesthetic purposes and prevents your dog from getting ahold of it. This iTouchless design is equipped with the basic touchless design, with added complete odor control! This option includes 1 odor filter and 1 lemon-scented fragrance cartridge. Your dog won’t be able to tell that this contraption is actually a trash can! You can enjoy a fresh smell wafting from the garbage can instead of the usual unpleasant stench. The instant lid reopens technology is safe and won’t snag your hand or any part of your dog if it does manage to get it open. 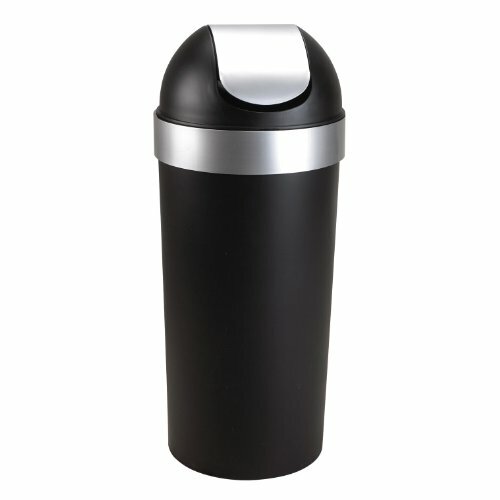 With an elegant matte finish and fingerprint-proof material, this is more like a decoration than a trash can! Why We Like It – iTouchless guarantees better value and quality with trash cans suitable for any part of the house with no custom bags required. Your beloved pup can face a lot of health risks if they do manage to go through the trash and ingest less than favorable items. If they by chance manage to consume leftovers or food that’s gone bad, they can suffer from an illness quite similar to food poisoning in humans. Let’s look at the key factors to look for in dog proof trash cans. Sturdy and Durable – Tough material ensures your dog won’t be able to use sheer force and get to the contents inside. Strong Lid – A lid that can’t be tipped, toppled or lifted open is ideal to prevent your dog from trying to dive right in. Heavy – The heavier the trash can is, the less likely your dog will be able to tackle it. Odor/bacteria control – This is pretty self-explanatory. Odor controlled trash cans will less likely attract your pet to it and have them try to get at the contents. If you’re able to hide the trash can, say in a pantry, closet, or inside a cabinet, it will greatly lessen the chances of your dog getting into it even without a dog proof trash can. Let’s look at some of the health risks your dog faces if you choose not to use a dog proof trash can. Poor hygiene – We all know what gross things are thrown in and could possibly live in a trash can. Imagine if your dog gets into it and has the foul content smeared all over himself and/or your kitchen. Very unsanitary. Dangerous and harmful items – Some pups may get into leftovers that contain things inedible by dogs such as chocolate, or grapes and bones that may get lodged in their throats. Some harmful chemicals like cleaning products or detergents can also be accidentally ingested and cause your dog very serious harm. Sharp objects – If you aren’t careful and your dog goes through the trash and recycling, they are susceptible to glass shards and other sharp objects that may puncture their mouths or cut parts of their body. A dog proof trash can should be your final line of defense. The best and most effective and fool-proof way to keep your pup out of the trash is to simply remove it from sight. Just like the saying ‘’out of sight, out of mind,’’ keep the trash in an unreachable place such as under the kitchen sink, or on the counter. When it comes to digging through the trash, the mess is actually the least of your worries. Invest in a good dog proof trash can today, not only to save yourself the hassle of a cleanup but to keep your dog safe. Hopefully one of these trash cans or our extra tips dissuades your dog from further trash diving. If your dog is constantly hungry due to insufficient calories, or you force them to wait too long between meals, they could be more prone to going through the trash to find food. Fight this with an automatic dog feeder. Another reason they dumpster dive is because they smell something irresistible. 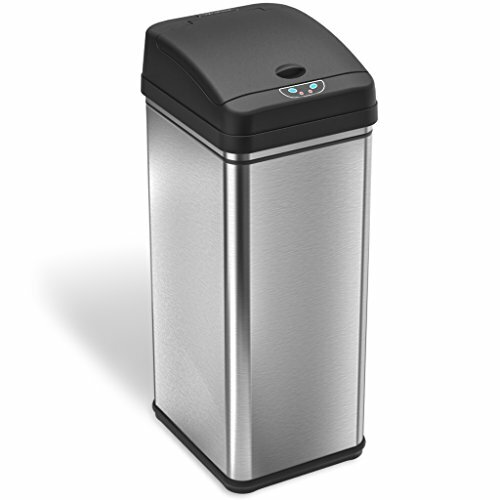 Get a trash can with odor control and is airtight, or double or triple bag your garbage. 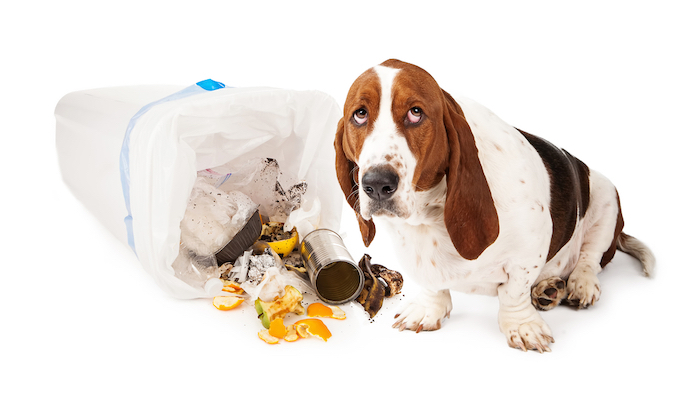 Giving your dog something to do could minimize the chances of them rummaging around the house and through the trash. Giving them a dog puzzle, or something like a bully stick as we’ve suggested before can help with separation anxiety and boredom.